NAGANO–More than half a century after fossils of Naumann elephants were discovered at Lake Nojiri in Shinano, Nagano Prefecture, the hunt for more fossils of the ancient beasts is continuing–and everyone has been welcome to take part. About 83,000 fossils and other items have been unearthed over the years during excavations that have been dubbed the “Lake Nojiri method,” in which anyone–including children–can dig for fossils of the elephants that lived in the glacial age but have been extinct for thousands of years. About 24,000 people have participated in excavations at the site since 1962, and about 230 people, aged between 5 and 78, are scheduled to take part in the 19th dig that runs from last Saturday to this Saturday. Fossilized Naumann elephant teeth were found at Lake Nojiri in 1948, and excavation started in March 1962 with the support of paleontologists. In the 50 years since then, many precious fossils, including those of Naumann elephants and elks from 40,000 years to 60,000 years ago, have been discovered. “Nojiri-ko Tomo no Kai” (association of friends of Lake Nojiri), a group formed by participants in the excavations, has expanded to 22 organizations across the nation. On Saturday morning, about 80 people attended a groundbreaking ceremony and started preparatory work at the site. Tadao Kobayashi, a former middle school teacher who is now an adviser for the excavation and research team, has participated in every excavation. Kobayashi, 75, from Sakado, Saitama Prefecture, said he could not forget the emotional moment when his students who were with him on an excavation found some Naumann elephant bones. 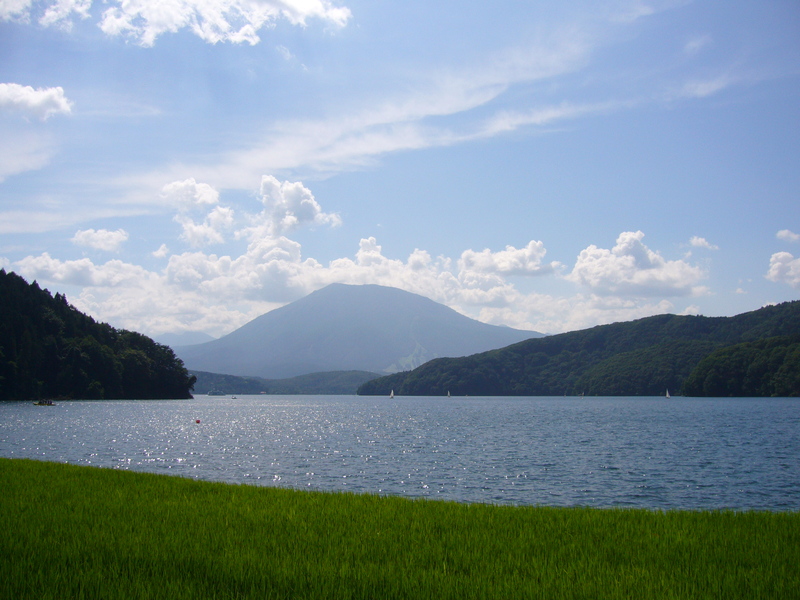 Kobayashi has brought about 100 students to Lake Nojiri over the years. His daughter, 45, whom he brought to the site when she was a kindergartner, is a mother herself, and she took her two primary school age daughters to the previous excavation in 2010. The number of participants peaked at 3,652 in the 1975 dig. “I’m glad that so many people have participated in all the excavations. I think this still fascinates people,” Kobayashi said. It is not just fossils that have been found at the site. Takashi Kimura, a company employee from Chigasaki, Kanagawa Prefecture, found true love when he took part in the 1984 excavation and met Shigako, who is now his wife. Kimura, 47, was a university freshman at the time. Since 2003, the Kimuras have taken part in three excavation with their two sons, and they plan to come and scour the site this month with their second son, 12. Shigako, 47, has been searching for fossils at Lake Nojiri since she was a primary school student. Her father was a geoscience teacher.